I’ve long wanted to write an article about my husband’s elementary school days, especially because he had such a different experience than I did. For instance, he went to a one-room rural school on the Prairies, while I went to an urban school in northeastern Ontario. He received a public education, while I was taught by nuns and secular teachers. 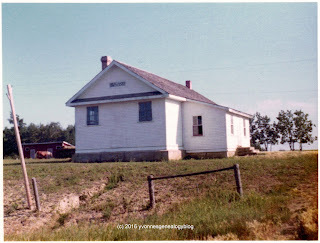 Michael attended Evadale School, located about seven miles northwest of Arran, Saskatchewan. He was there for Grades 1 through 5, from September 1959 until June 1964. 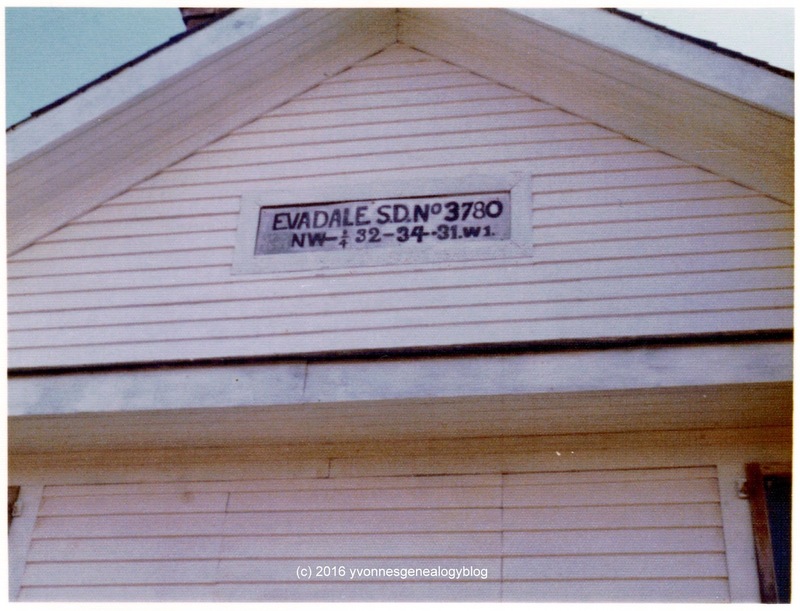 Later, when his sister was old enough, she too went to Evadale, but only for Grades 1 through 3, because the family moved into the nearby town of Kamsack. Michael took these photos on a trip to his home province in the summer of 1973. I've gathered his reminiscences in point form. 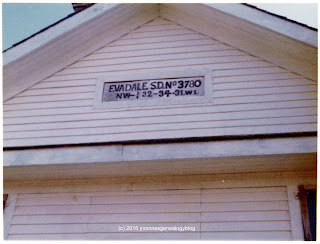 • My Dad told me that we lived exactly the same distance from three schools, but he chose to send us to Evadale. • The school was three miles east from our farm. For the first couple of grades, my Dad drove me until I was old enough to walk by myself or with friends. • My Mom used to tell me the story about my very first day at school (Grade 1) and how I couldn’t wait to get there, but when I arrived, I started to cry and refused to go inside. It took a lot of coaxing and I finally went inside. • The school was on two acres. There were swings and teeter-totters, a teacher’s residence, and off in the distance, a barn and an outhouse. • It was one large building: 2/3 of it was one room for the classroom with a wood-burning stove, then the other 1/3 was divided into the entrance (we’d hang our coats and leave our boots here; firewood was also kept here) and a storage room for supplies. • Just about every year we had a different teacher. There were about 28-32 kids in all per year. Sometimes there’d be only one student in a grade. Our teacher taught one grade at a time. • I think I started walking to school in Grade 3. I remember meeting up with my friends Dmitro, Doris, and Lawrence on the way. • I’d leave about 45 minutes before class started. Some days I’d take my time and explore the bushes on the side of the road. One day I was late and was scared to go inside, so I stayed outside and sat by myself. A student going to the outhouse saw me near the school door and he told the teacher. She came out and asked me why I didn’t go inside. After talking to me for a bit, she told me to not worry and just go to my seat and that no one would notice. • In good weather, my sister and I would walk or take a two-seat horse buggy that we’d park at the school’s large barn. There was room for about a dozen horses. • I don’t remember which horse it was, maybe Fly or Prince, but after it was trained, it knew the route to take, enter the school grounds and pull up to the barn. I’d unhitch him, take him inside to his stall and then give him some hay. • In winter, we’d get into an old car that my Dad had removed the roof and dashboard, and added runners. Our horse would pull the car to school. When it was very cold, my sister and I wrapped ourselves in blankets and duck under where the dashboard used to be to keep warm. • I remember we had sports days before the end of the school year. I usually would enter track-and-field events like broad jump, high jump and 100-yard dash. Sometimes, I’d get ribbons for broad jump. • I did well at school and almost always got straight As. It was hard to leave all the friends I made there when we moved into town in July 1964.